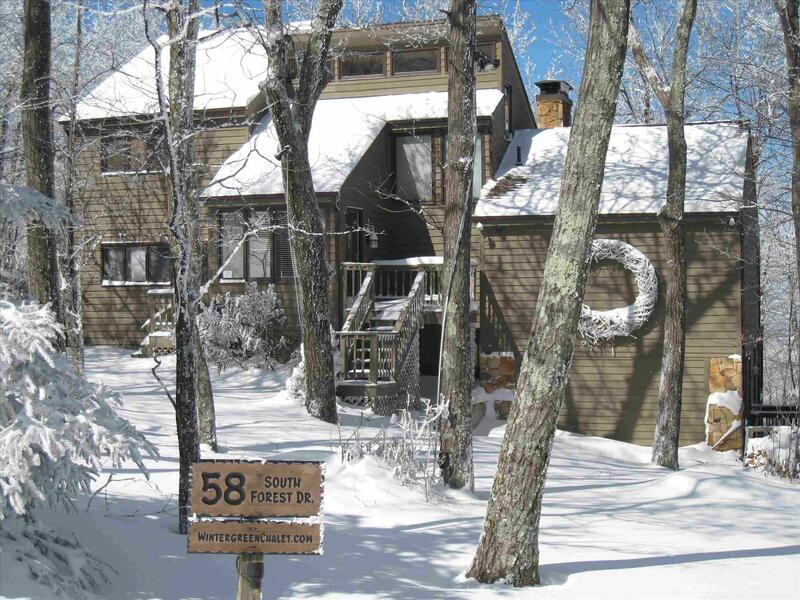 The Wintergreen Chalet is a sprawling 6-bedroom 4.5 bath home located at the top of Devil's Knob Mountain within the Wintergreen Resort in the Blue Ridge Mountains of Virginia. The home sleeps 12-14 comfortably and is available for rent daily or weekly throughout the year. Our home is set on a private road at one of the highest elevation points in the resort and offers beautiful seasonal views of the Shenandoah Valley. It is within 1 mile of most amenities including golf, tennis, snow skiing, swimming, hiking, restaurants and the Winter Garden Spa. The large wooded lot provides plenty of privacy and a great place for little explorers to climb the natural rock formations surrounding the property. In addition to the professionally decorated 4,000 square-foot interior the home has over 1,000 square feet of outdoor deck space. A 6-person hot tub is also provided for year-round fun. This house was absolutely perfect our three families. It was well equipped, clean, and had more than ample room. We hope to go back in the future. Thank you! Great spot. We will be back. Very clean and comfortable and spacious. Has everything you need. Five minute drive to slopes. We had a group of 14 in the house for a weekend of local wine and brewery tours. It was spacious and peaceful. The owner was also very good about sharing details on where to go and how to make the mos...read more. This year I was very Lucky my children took us to Wintergreen Chalet to celebrate our 50th Wedding Anniversary. The house is very beautiful and accommodated my whole family. There was plenty of room s...read more. Not disappointed - and would stay here again! This place is great! Everything was exactly as advertised, and there were no surprises. There's plenty of space to spread out - we had a full house but the place is so large that sometime we had to go...read more. We wanted a nice, comfortable place for our family to stay together during the long weekend of graduation ceremonial events at the University of Virginia. We thought individual rooms stretched out in ...read more. Maison très propre et bien entretenue. Beaucoup d'espace pour préparer nos repas et pour manger tous ensemble . C'était supert !! The owner has done a fantastic job- it is better in reality than it is on the picture, which is rare with rentals. One thing that jumps out is the QUALITY of the things in the house, especially two sp...read more. Question: How are payments made? Answer: We take payment in full when we approve your reservation. This ensures the home is reserved for your stay and simplifies the process. You’ll have an opportunity to review the refund policy, defined in our rental agreement, as part of the reservation process. When making a reservation you’ll notice a fee for the damage deposit. No charge to your credit card, related to the damage deposit, will occur unless damages are found post departure. However, we will verify with your credit card company that your card has available credit to cover the damage deposit prior to check in. Question: How far is your house from resort amenities? Answer: The house is 5 minutes or less in drive time from all amenities including the ski slopes. Question: Do you offer discounts on rates or resort amenities? Answer: Our preference is to offer very competitive rental rates leaving more money in the pockets of our guests to spend as they like. Therefore, we do not offer discounts on rates or resort amenities. Question: What are the check in and check out times? Answer: We offer flexible check in and check out times. When there is not a check out and check in on the same day, guests may check in as early as 12:00 PM (noon) and check out as late as 12:00 PM (noon). Otherwise, check in may not occur until 4:00 PM and check out must occur no later than 11:00 AM. Question: Will we have access to the resort facilities? - You may use Stoney Creek’s Lake Monocan Sunday through Friday. - The Wintergarden Aquatics and Fitness center may be used as part of a spa treatment at the Wintergarden Spa. - If you’re interested in playing golf or tennis at Devil’s Knob please contact me prior to reservation confirmation. Answer: We do not allow pets. We get many inquiries from people with allergy issues who need a pet free home. Question: Is your calendar up to date? Answer: Yes. Our calendar is updated in real time when reservations are accepted. Question: What is the bedroom/bathroom configuration? Answer: The master bedroom, located on the main floor, has a dedicated full bathroom with a separate toilet/shower area. Bedrooms 2 and 3, located on the top floor, have direct access to a shared full bathroom with a partitioned toilet/shower area. Bedroom 5, located on the lower level, has direct access to a dedicated full bathroom. Bedrooms 4 and 6, located on the lower level, have access to a full and a half bathroom. Question: Is the resort shuttle available at the house? Answer: The shuttle is currently not available for use. However, the resort changes the policy without notice. You may find the shuttle to be available during your stay. By taking time to read the information made available you will help me improve your stay. This will allow me to focus my limited time on property improvements and guest needs. The automated reservation system can be used to check for available dates, receive a price quote, review the rental agreement and place a reservation request. I will contact you by phone prior to finalizing a reservation and charging your credit card. If you still have questions, after reviewing this website and using the reservation system, you may email me by using the "Contact Us" section below. Please make specific inquiries. * Our calendar is updated in real time and is, therefore, accurate. * When viewing the calendar keep in mind that it is possible to checkout on the first day of another reservation. * The property will not be reserved and your credit card will not be charged until we accept the reservation. * You will have an opportunity to view the rental agreement prior to submitting your reservation request. * We take payment in full at the time we accept the reservation. Our refund policy may be found in the rental agreement. * There is a 3 night minimum for New Year's Eve, MLK Weekend and President's Day. * There is a 4 night minimum for Thanksgiving. * Holiday rates will be included in the quote and can add substantial cost. Enter coupon code C150 to receive the three night discount. (The three night discount does not apply to weekly rates). We're located in the Wintergreen Resort in Virginia.